You can manage the way you are notified (or not notified) of new content, messages, or many other items. 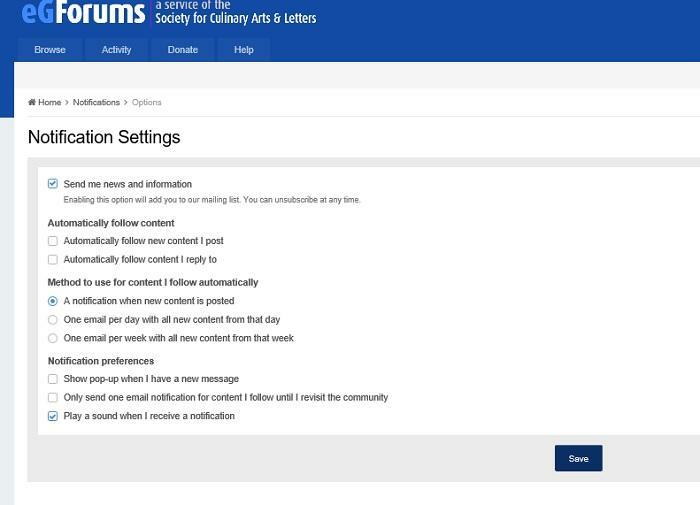 Your choices are to be notified by email, the notification list when you are logged onto eGullet, or both. To set your notifications, click the bell-shaped icon near the upper right corner of the screen. A notification list will open. At the upper right corner of that list, click on "Notification Settings". All your options will become visible. The screen shots below show some of your choices. When you have made your selections, click "Save". You can always change notification methods later. Any messages you have stored will appear. You compose and send messages from this location. It's important to understand that Personal Messages are private and should not be shared, with the exception that an abusive PM should be reported to eG staff. New notifications and new PM's will be indicated by numbers next to their respective icons. In this example, there are 3 new notifications and 1 unread message. In addition, some browsers will show a message at the bottom of the screen notifying you of a new notification or PM. The message will fade after a few moments, but in some browsers provides a brief opportunity to click on the link for the unread content.